Pick up your attendee name badge in the registration area during posted hours. Bring your confirmation email for faster badge retrieval. Name badges are required for admission to all sessions, social events and the Exhibition Hall. 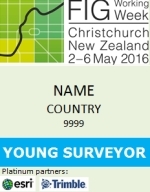 A student/Young surveyors is defined as students and graduates aged 35 or under at the time of the conference, who are either currently studying/gratuated for a Bachelor, Masters or PhD degree of surveying or related studies. After Apr 2, 2016 - No refund. Payments are non-refundable after February 2, 2016. Please visit Visa Information for details on visa requirements for foreign persons visiting New Zealand. If applicable, we recommend you complete visa application at least 3 months in advance of your travel dates. Be sure to take advantage of the FIG Working Week's Star Alliance discount program when booking your flight to Christchurch and receive up to 20% off your air travel.